Plans are underway to travel once again to Ireland next summer… and you are invited. This year’s trip was so magical we have decided to host the second annual “Spirit of Ireland Journey: Ruins, Runes and Tunes.” There is way too much information and excitement to put into a blog entry, so the links below offer more insights to the trip, which by all accounts is a healing journey (on many levels). This trip offers a most authentic experience of Celtic culture, history, music and much, much more. We travel to many sacred sites in the southeast region of the Emerald Isle and participate in many private healing ceremonies combining meditations with music for a most unforgettable experience. The trip is limited to 22 people and we have 10 spots left, if interested, please visit the websites (via the links below). Irish eyes are smiling, Ireland is calling… so start packing your bags. Rarely do I use this forum for marketing, but since so many people have asked about next year’s trip, I thought I would share this info here: Thanks….. This trip included many effective coping techniques for stress including guided meditation, music therapy, social support groups, the healing power of prayer, and many more. Even if you don’t have Irish roots, you will recognize the irish spirit in all of us, and that’s no blarney (wink). This second link will take you to my photoblog of the 2010 trip to Ireland. “Magical….That’s exactly the first word I have been using to describe my amazing journey through Ireland. Thank you sooooo much Luke!! I am still high, and I know I will treasure the million different moments we experienced for a very long time! I will write more specifically later…but just wanted to say hi and to express my gratitude to you for being the catalyst for our magical mystery tour! I miss everyone too!”—In appreciation – Anne Kearney. The harp is the national symbol of Ireland. 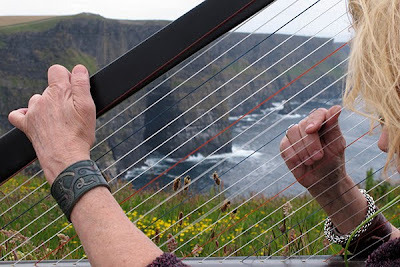 Here one of our group members (Fiona) not only brought her harp, but played it here at the Cliffs of Moher. Simply magical. Thanks, Fiona!